The volcano of Santorini is undoubtedly the main attraction of the island as people from all over the world are annually visiting the island to see for their own the most popular and spectacular sight of Santorini. The volcanic activity that gave the island its shape and its intriguing geological structure are the first things that you notice and with no doubt you will want to explore it even more. This amazing greek island is a place of lovers: nature lovers, volcano lovers, sunset lovers and of course holiday lovers wishing to experience the most unforgettable holidays of their life! 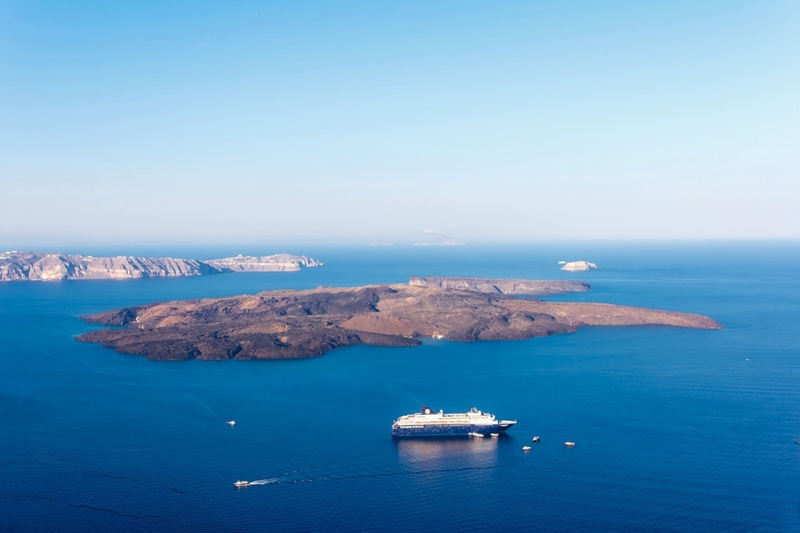 The oldest volcanic centers are located in the area of Akrotiri, in the southwest of Santorini. Also other smaller volcanic centers appeared in the island and caldera took its name from the cavity that was formed. The volcanic eruptions gave the island a unique character and the volcano became the main characteristic of the island. The amazing caldera and the Kameni islands create a somewhat amazing scenery that you have to see when in the island as it is one of the main attractions along with the colorful and romantic sunset.If you are thinking that the volcano is a sight that you will be watching from a distance then you will be amazed to discover that you can see the breathtaking view of the caldera since there are available cruises there and one thing is certain: once you step on black lava ground of the steaming volcano you will be mesmerized by this amazing greek island. Nea Kameni, the central one annually attracts so many people eager to discover the volcano’s crater and experience unforgettable moments and see amazing views of the villages from a great heights that you will never forget!